A central aspect of birdiness is the ability to make vocalizations. Birds have a unique organ for doing this, the syrinx, and virtually every bird on the planet makes use of it. Bird vocalizations have a wide variety of communicative functions, including attracting mates, declaring territory, sounding alarm, or simply keeping in touch. The syrinx isn’t the only way that birds communicate aurally; they also make a variety of mechanical noises, with their wings, their tail (see the Pin-tailed Snipe Gallinago stenura tail on the right), or their bill. Sounds aren't the only way birds communiate. They dance, for example, and they can display certain showy feathers. They can also communicate passively; in some species males can signal fitness simply by being bigger or brighter or longer-tailed. 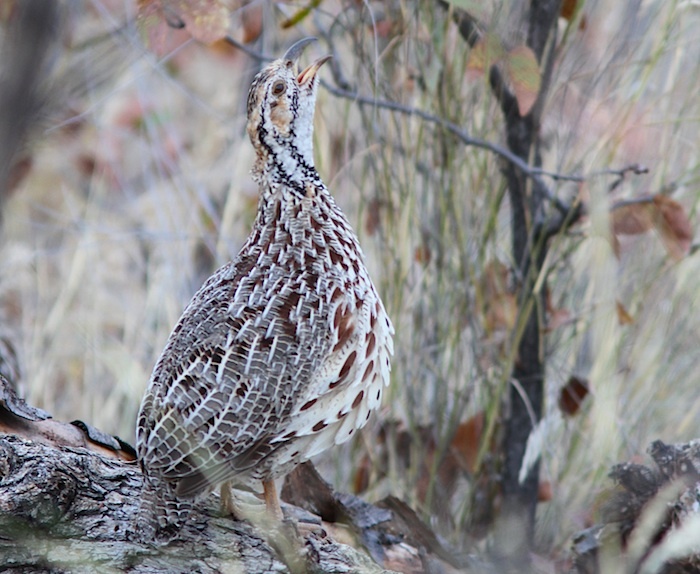 The most obvious way birds communicate is through song, as this Orange River Francolin Scleroptila levaillantoides is doing. Photo by Josh Engel. 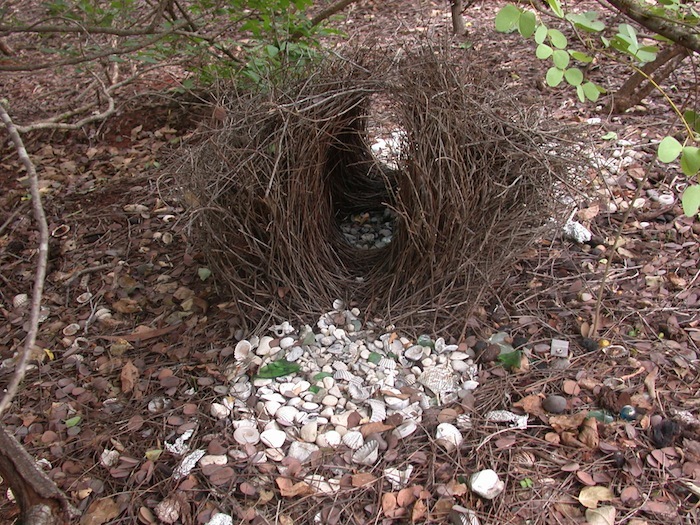 Male bowerbirds (found only in Australia and nearby islands) build a decorated "bower" to try to attract a mate, even though the bower itself is not used for nesting. This is a rather unique form of communication, as it has been found that "better" bowers are built by larger males. This is the bower of a Great Bowerbird Chlamydera nuchalis. Photo by Josh Engel. Snipe "sing" with their unusual, narrow outer tail feathers. Photo by Josh Engel. Many birds are named after their vocalizations, such as laughingthrushes. Photo by Josh Engel. These crows have a simple message for the Cooper's Hawk: Go away. Photo by Josh Engel. One of the U.S.'s great songsters, the appropriately named mockingbird. Photo by Josh Engel.